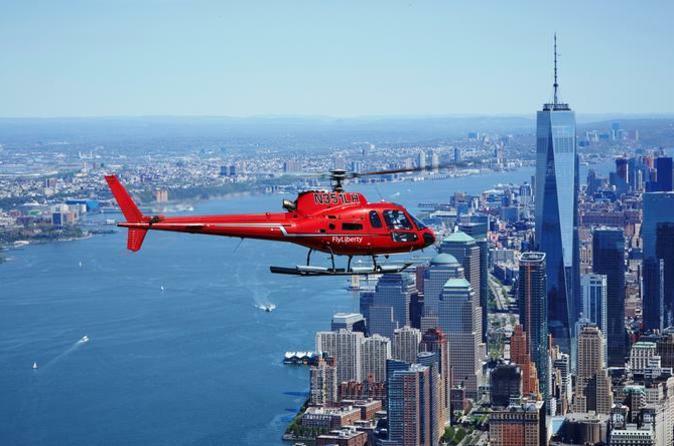 Enjoy stunning panoramic views while you explore the vast landscape of Manhattan, Brooklyn and Staten Island and so much more on this world class pilot narrated aerial experience.Your photo opportunities are galore! Make your way to the HHI Heliport in Kearny, New Jersey, just a 10-minute drive from the Lincoln Tunnel or choose to include the optional roundtrip transportation option for a one of a kind flight experience. Upon your arrival into Kearney, you will have a safety briefing and introduction before climbing into your helicopter for this small group experience for photo opportunities galore! As you enter Liberty Harbor, you will enjoy stunning views of Lady Liberty herself along with Ellis Island and Governors Island. As you approach Lower Manhattan, take in views of One World Observatory, Battery Park and South Street Seaport. Take in the views of the marvelous bridges in the East River including the famous Brooklyn Bridge and Manhattan and Williamsburg bridges. You will see many Brooklyn neighborhoods as well as Staten Island which will be home to the New York Wheel in late 2018, early 2019. Upgrade to include your very own roundtrip private transportation from NYC to Kearney NJ heliport so you can sit back and relax before and after your once in a lifetime photo flight. Please note: The listed price does not include the heliport fee, USD$25.00 per person, payable at the time of tour check-in. Special Offer - Book by July 31 to save 5% off our previously offered price! - Book Now!